This interview was recorded in 1995. 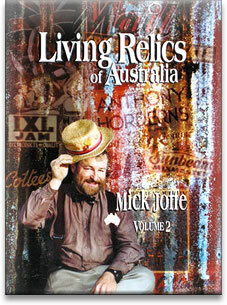 It is the first story in Living Relics of Australia. Landing at Gallipoli, some of them were drowned getting out the back end of the boat. They just drove the front end onto the beach; the back end was in deep water. They were in trouble with 250 rounds of ammunition; that alone was enough to sink them. We didn’t carry that; we only carried 50 rounds ‘cause we were classed as mounted troops and we had a bandolier with only 50. I got out pretty well onto sand. The infantry had webbing equipment and they carried the ammon on pouches each side. Of course, they were the fighting solider and they copped the worst casualties. The first lot fought their way on. The beach was under rifle fire the whole time. We landed in a bad place, practically no beach and hills started straight up. Some say the current took us to the wrong place. I’ve got no idea. You had to keep your heads down. The third brigade made the first landing. We were in the first brigade, New South Welshman. The second brigade was Victorian. The third brigade made up the Division. There were 12 Battalions in the first Division. They were firing through loopholes and steel plates, only a certain number of places. If you put your head up, that was suicide. Even so, some were killed with shots going through the loopholes ‘cause the Turks were pretty good shots. Things were happening that fast, all you could see was what was happening around your own little spot. Self-preservation, animal instinct, that certainly applied there. In France they could be relieved and come out, but by the little bit I could see around me at Gallipoli, the infantry could get no relief. Slept in the trenches. We had our own little dugout where we slept. It was a hold that we dug ourselves just big enough for 3 of us to get below ground level. I had 2 shot in it and I didn’t get a scratch. One next to me got hit in the leg, hit an artery, and they had no blood transfusion, of course, in those days. Later that day the other bloke got hit in the neck, just missed his spine. He survived the war - Harry Osborne. They said, “If it’s got your name on it, you’ll get it.” I was in that one hole for most of the 9 months except for a fortnight we were taken to Lemnos... That was like a holiday in heaven and we were issued with a bittke if beer a day and we could buy cognay. One officer, a captain, said, “Not everybody drinks, so we won’t put in an indent for so many.” A Lieutenant Tinkler screamed, “Give us the bloody thing! I’ll sign it!” What a lousy thing to do, eh? After being on Gallipoli all that time and lucky to get water. There were all sorts in the world, of course. Tinkler was a Colonel at the finish. 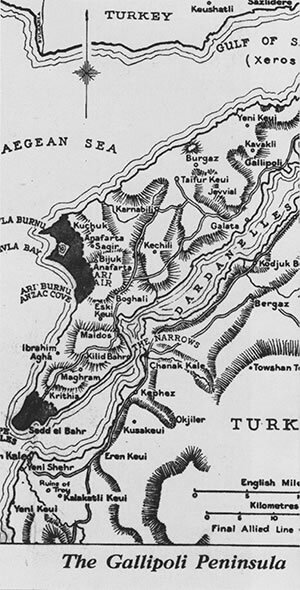 The Allied line: The Anzacs held the Anzac Cove area. They were bringing dead Turks down and dragging them past us after they’d been in the sun a couple of days. We were sitting eating our dinner while they dragged ‘em past us... like dead dogs, and I though then how quickly you get used to conditions. War is a terrible thing. I was attached to the second Battalion for a while to maintain telephone communication back to the Brigade. See, we had some telephones but no wireless. When we first landed, we used flags. I suppose it did make us prime targets and numbers of the signallers were killed. Signalling didn’t last long at Gallipoli ‘cause signallers didn;t last long. Some of the men had premonition they would be killed; I don’t know why. You had to concentrat. I never felt that I was going to get killed. Some felt it and did; some felt it and didn’t. Birdwoow was the only General I know of that was up in the front line and he got a lot of respect from the troops for that, whatever his reason was. That’s not a General’s place but he was well liked. The British Officers thought they were more aloof than that. Of course, in the British Army you could buy your officer’s commission if you were a big shot. In the Australian Army you had to earn your commission. Much more class distinction in England than compared to Australia where there was practically none. The British Officers didn’t mix with the men at all. On the landing day none of the troops had a feeling of being defeated but Birdwood initially wanted to withdraw the men. The final withdrawal was the best organised thing of the lot. I don’t think there was a man even wounded. They had 3 days’ silence - troops told not to fire unless attached, and then when they did leave they set up rifles with water dripping and we could actually hear our own rifles firing when we were on the beach. Gallipoli was a cow of a place. No water. Our first rations were hard biscuits, like pieces of wood. I used to wonder what God was doing at Gallipoli but it’s really too deep to think about. I was never sick there, despite all the dysentry caused by flies and bad living conditions. A lot of sickness there is in any war. I saw 2 warships sunk - the ‘Triumph’ and the ‘Majestic’. We had not much artillery except small Indian mountain guns. The war ships were firing over our heads. The ‘Queen Elizabeth’ was the biggest warship afloat at the time. There was a Turkish machine gun that was giving a lot of trouble. 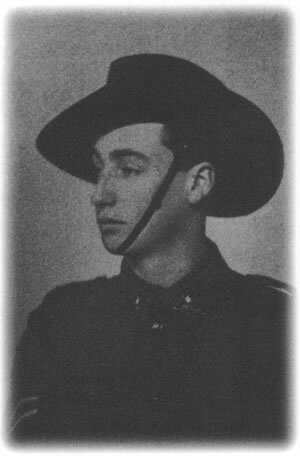 Albert Jacka went out by himself and took the machine gun post... about 5 men, killed the lot of them. How he did it I don’t know. Must have just missed him. I actually witnessed him climbing up and over. He did get a commission after that. It was a brave act. There wouldn’t be many that would get away with it if they tried. They say he could have got the VC several times over. They were the real fighters, the infantry. We were with them but not of them, if you get what I mean. We were there to maintain communication between units. It was done later in France by phone and dispatch riders on motor bikes but Gallipoli was primitive - runners, flags. It seems a terrible long time ago; seems like another lifetime. Well, it’s over 80 years - more than some people’s lifetime. I don’t know why I’ve grown so old except that I haven’t died yet. I did all sorts of things I shouldn’t have done. 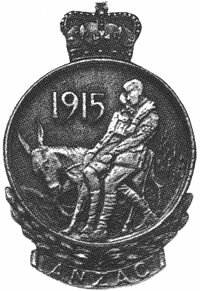 After Gallipoli, I went to France in the 4th and 5th Divisions and I was there till the war ended. I was a corporal. I saw out the entire Great War. We didn’t hate the Turks and they didn’t hate us. We visited Turkey after and one old Turk said, “We didn’t hate you. You had a job to do and we had a job to do.” Turkey wanted to make a pact with England one time and England wouldn’t do it. This is in hindsight, but a politician should be able to see ahead a bit, shouldn’t he? If they had, they would have had the Dardanelles without fighting for it. 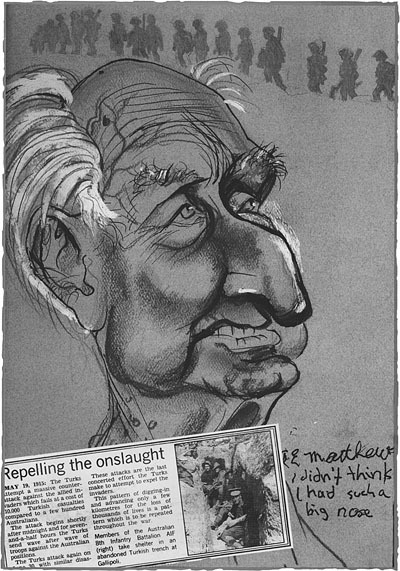 I blame Gallipoli on the bloody fools of the British Empire. We were all volunteers. I would say the Australian Army was the only volunteer army in the world. One of the things the soldiers in the Australian Army were noted for was their mateship. The Australian artillery was supposed to be the best in the world, and our infantry went up against the Prussian Guard (they were supposed to be the best) and defeated them. Most of the battles were not decisive, they didn’t settle anything. Not until Villers-Bretonneux which was decisive and was Australian troops only. I rode a horse for 3 hours then marched for 19 hours to get there. That’s a long march, 19 hours! They say the French were packing up to leave their homes and the word came that the Australians were coming so they stopped packing and stayed. That’s the legend, anyway. That was the final battle of the whole war; the German army then completely collapsed. It was good to be there. The Australians liberated more French villages than any other army; drove the Germans out. Some called us “5 bob a day murderers” but the politicians were the murderers. As prisoners, the Germans were like any other person, quite mild of course. One of them might have been Hitler [he was taken prisoner in WWI]. At Anzac Day reporters from different papers and TV stations swamped me. After Anzac Day it all went quiet on the Western Front again. I don’t feel I’ve done anything to deserve any special attention. I think the only reason for the publicity is that I’ve lived so long, not for what I’ve done. People say we are glorifying war. This is quite wrong. We are remembering our dead. Anyone who has seen war and glorifies war is a lunatic. It’s an awful business seeing men like that. War is a stupid business and it doesn’t settle anything, mostly. There’s politicians that make war but they don’t go to it. If they had to go, there wouldn’t be any (laughter). That’s only my opinion. There should never be wars but there always have been and while there are men, there will be war. I don’t believe in war but I believe in remembering. I don’t need a Remembrance Day because I will remember always, but young people need reminding because they have not known the horrors of war and we hope they never will. The Australian Army were noted for their Mateship. Do unto others as you would have others do unto you - that’s an old saying I remembered as a kid. If people followed that, we wouldn’t have half the troubles we have today. Of course they don’t. A lot of them ‘do others before they do you’. Always be prepared to defend your country if necessary. I like the Australian flag. I reckon it’s a crime to alter that flag. It’s the one national flag that does represent the country. It’s got the Southern Cross that represents the country. That was the first thing the troops looked for when they were sailing back to Australia. We knew we were getting close when we saw that ‘cause it’s not seen from other parts of the world. The French flag, what does that represent? Nothing! The Australian flag represents the country more than any flag that I can think of. I know a lot of men that died under that flag. I think about 60,000 men died from Australia in the Great War. That’s a lot for a small country, isn’t it? It was a good enough flag for them, wasn’t it? The fact that I was born in Australia was the best thing that happened in my life. Because of what I’ve seen of other countries, Australia is the best country in the world. I’ve been a carpenter on mostly city buildings. I worked on the Hotel Australia when they added a few floors to it. I used to walk from Belmore to Circular Quay to collect rations when there was no work. In a way, the Depression was worse for us than the war. During the war we only had ourselves to think about; during the Depression we had a wife and family. I had 2 daughters. One died 5 years ago and the other’s in America. She was born in 1926 so she must be 70. Taking it all round, I’ve had a pretty good life. Only thing I’m sorry about - my only remaining daughter is in America. I’d like to see 100. Not sure what would happen beyond that; I’m not worrying beyond that. The way I’m going now, I will. I’m in quite good health. There’s only 4 years to go to reach the year 2000. There’s not much I can do about reaching it but I’d like to. They say they’re getting me a walking frame. I’d look a funny old sight getting up the cliffs at Gallipoli in me walking frame (laughter). You know, I can’t remember climbing up there. That book, ‘The Last of the Anzacs’ said of the 17 still alive from Gallipoli, I’m possibly the last one from the original landing. I went back after 75 years, in 1990. One fellow had his 103rd birthday out there. We had a bit of a party and a birthday cake. The Turks were very nice, no hatred at all. Here’s a photo I had taken with a nice young Turkish family. I don’t mind telling my story if it will be of interest to young people. I’d like to tell them: Never get involved in foreign wars like Vietnam but always be ready to defend your country, not someone else’s. Let’s hope they never have to ‘cause war is a terrible business. I’ll be 100 in November, on the 11th day, the day the war ended. The best present I ever had or am likely to have. I was going on 90 days’ leave. I was on a troopship in the Indian Ocean when I heard the good news. Getting old is simple... just don’t die. I’m not afraid of dying, it’s the way of dying. If it’s quick you won’t know anything about it. That, just as the steamroller of history rolled over onto his 100th birthday, he became the last living Anzac from the Gallipoli landing. That this event should happen of all days on Armistice Day, the day the war ended. That of all the men, the last sentinel, the last spokesman after 81 years, should be not just another crumbled-up, uncommunicative hospital patient of 100, but a well-dressed dignified man who was able to receive and entertain our Prime Minister and many others... and such a thinking man... such a humanitarian. At the going down of the sun, and in the morning, we will remember them... Lest we forget. ‘He was the living embodiment of the greatest of all Australian legends. He was a great larrikin, he always spoke his mind.’ NSW RSL president Rusty Priest. ‘His death removes the last link with the most defining moment in Australia’s history. He was a man of great spirit and I spent a very enjoyable hour with him last year.’ Prime Minister John Howard. ‘He was one of the fine group of brave young men who created for this country the Anzac legend, encompassing the spirit of courage, mateship and determination.’ Federal Veterans Affairs Minister Bruce Scott. ‘The foundations of our nation were built by the courage and bravery of Mr Matthews and the Anzacs.’ Premier Bob Carr.